It is not easy to explain to an uninsured person the terms “out-of-pocket maximum,” “plan category,” or the “individual mandate.” This is especially true for young adults who understand the value of health insurance, but are often enrolling for the first time and are not familiar with the terminology or their options. Yet, assisters are faced daily with the challenge of translating complicated and abstract health insurance terminology. According to a 2015 Urban Institute survey, approximately half of uninsured adults likely eligible for financial assistance – either Medicaid or tax credits and cost-sharing reductions– were unfamiliar with the coverage that might be available to them. The risks of going without coverage. This is a useful tool for assisters, community-based organizations, and individuals who are shopping for coverage during open enrollment. It can help users look beyond the monthly premium to think about the total costs of coverage, as well as how expensive it may be if they go without coverage. What’s more, it also illustrates just how valuable the cost savings are for users eligible for premium tax credits and cost-sharing reductions. 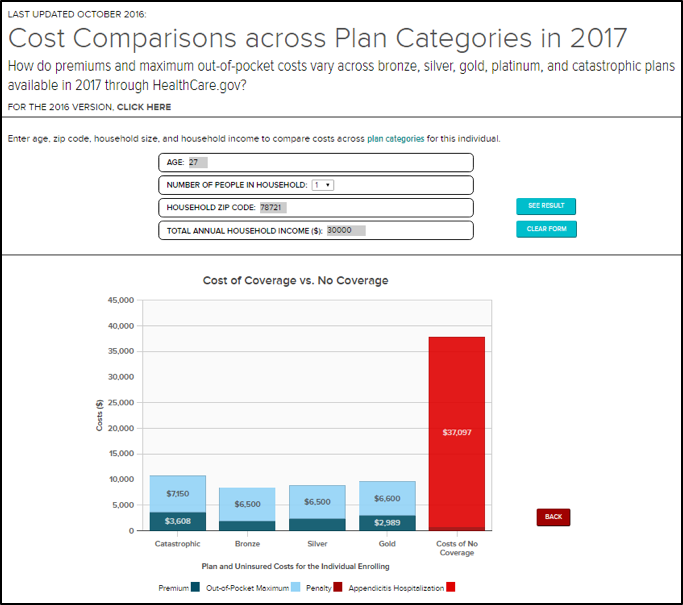 To access the tool, simply go to ACASpotlight.org and select Cost Comparisons across Plan Categories. Each open enrollment season has seen major progress toward lowering the number of uninsured; since its inception, an estimated 20 million people have gained coverage under the ACA. This holds true for Millennials as well, as the the rate of 18-to-34 year-olds without health insurance fell to 15 percent in 2015 from 17.2 percent in 2014 and 22.4 percent in 2013. By introducing new and improved tools to facilitate the enrollment process, we can see this trend continue in the 2017 enrollment season.